Kanwitch (John Hollis), a representative of a foreign power, brings his champion, Toy Sung (Terry Plummer) to face the supposedly undefeatable warriors trained by Jessel (Donald Sutherland). The champion is defeated - first in unarmed combat by one of the men, and then in a sword fight with one of the women, who slices his belly open. Nevertheless, Kanwitch demands one last test before his country will provide financial assitance. 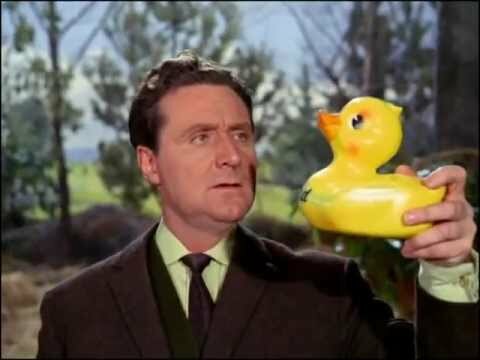 Steed is out hunting - he shoots at a passing flock of grouse, but finds a rubber duck in its place, on which is written 'Steed'; Mrs Peel pops up from the bushes, quacks once then says "You're needed" - to attend a fancy dress party thrown by the explorer, Sir George Robertson DSO CBE KCB, despite the impending case of seven atheletes killed in the last week. The party is to take place somewhere over the south of England! Emma drops him at the airport and he goes on board, where he meets fellow revellers Max Hardy (Hugh Manning) - dressed as a WWI German officer, Jason Wade (James Maxwell) - Gemini, Joe Smith (Gary Hope) - a matador, Freddy Richards (Leon Greene) - a campy circus strongman and Mrs Hana Wilde (Charlotte Rampling) - cowboy. 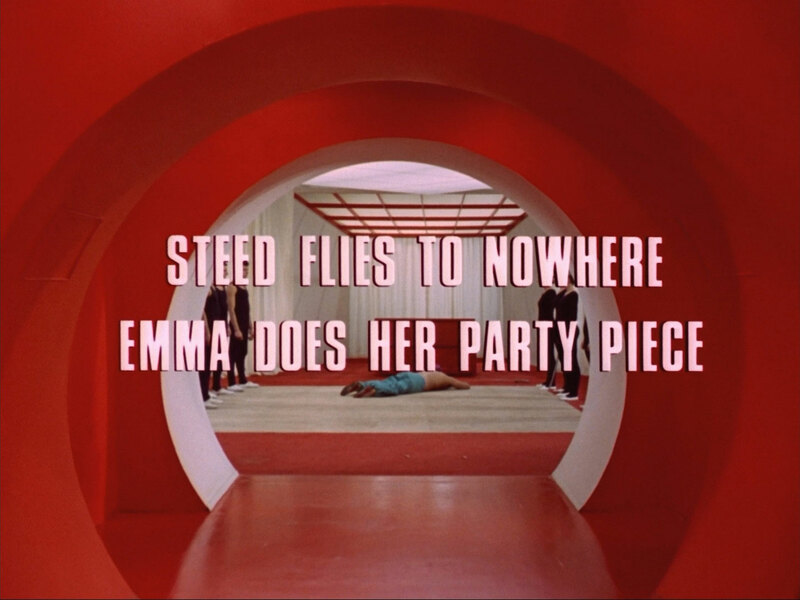 A late arrival is an executioner, who keeps his hood on, the stewardess (Margaret Neale) takes his invitation and we see she is the woman who killed Toy Sung. 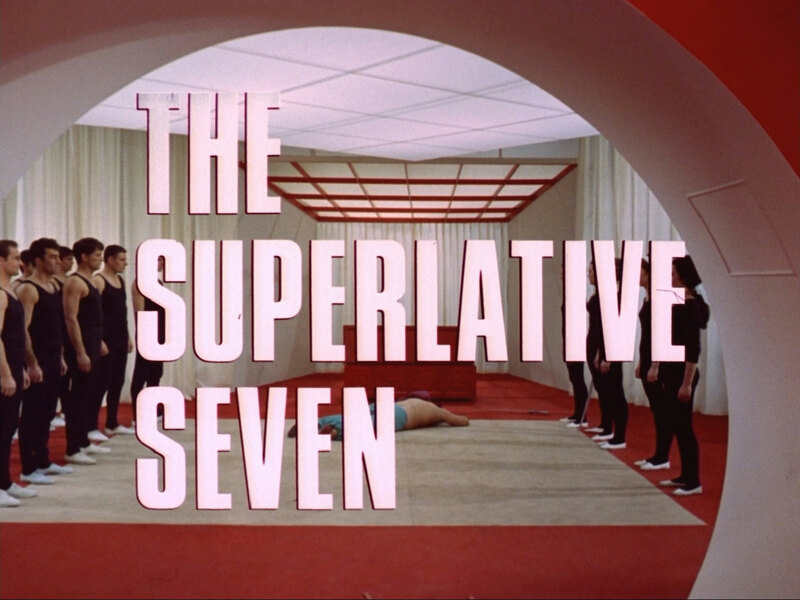 Inside, Hana tells Steed that Freddy claims to be the world's strongest man, and Joe Smith really is a matador; Steed already knows Hardy, a fencing instructor, and Wade tells them he "tracks things down", which they take to mean he's a big game hunter. Jessel's voice comes over the intercom, telling them to prepare for takeoff and once airborne they discover they've all been invited by different people. The find the cockpit empty and the plane running on autopilot, over open ocean. 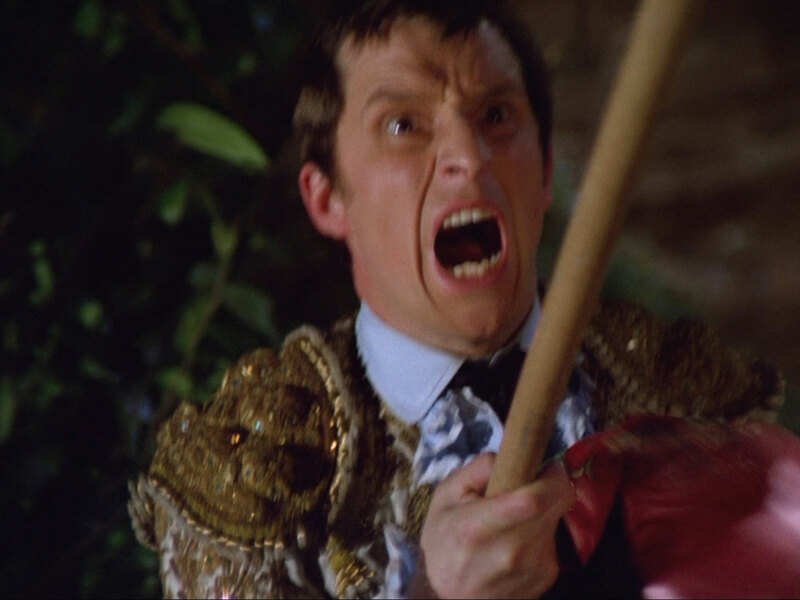 The executioner is revealed to be Mark Dayton, an unarmed combat expert and they realise the common factor between them is expertise is a physical pursuit, Steed claiming to "it's the way I fold my umbrella", while straightening a poker bent by Richards. Jessel sends the plane into a dive and he and Kanwitch are pleased to see their 'guinea pigs' reacting bravely. 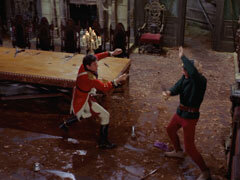 The plane is brought in to land on a small Atlantic island and the seven disembark, a lantern thorugh the trees directing them to a delapidated old house, the dining table laid with weapons instead of cutlery, six brand new coffins in an alcove, and Toy Sung's body in an ornamental suit of armour. Kanwitch announces they been brought to the island to test a new method of training fighters to a superhuman degree, and "your killer is in your midst, your killer is one of you!" Steed proposes they search the island and Wade suggests they split up to do so. 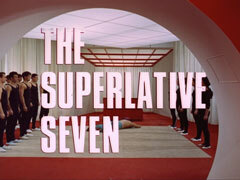 Hardy wants them all to stick together for safety, but Smith and Richards, used to working alone, head off regardless and the party splits up, Steed choosing to lie in wait at the house. Jessel gloats, "Three down, three to go! ", but Kanwitch refuses to sign over the funds until all six are dead. Meanwhile, Wilde and Dayton find a sprung Malay tiger trap and decide to lie in wait at the house - Hana screams to attract attention, and they trap Steed in a net when he runs in. They show him that Wade's body is now in the fourth coffin. A plane passes over the island and Dayton decides to check their plane and refuel it. He's attacked and garotted while priming the carburettors and we later see Hana standing worriedly over his inert form, while Steed frees himself with a knife in the house. Wade suddenly gets out of his coffin, announcing he is the killer, much to Steed's surprise - "But to be in two places at once! You were with me when Smith was killed". 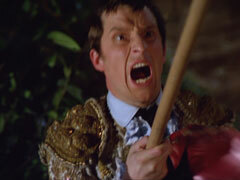 They fight, Steed enraged at Wade saying it wouldn't be 'sporting' to have attacked him while still bound, and Steed hurls the spear from the tiger trap into Wade's chest, the body toppling off a balcony into the grounds. Kanwitch is disgusted, the test is a failure, but Jessel assures him Wade will return. Hana returns, accusing Steed of Dayton's murder, and she knocks him out when he fails to find Wade's body in the garden. 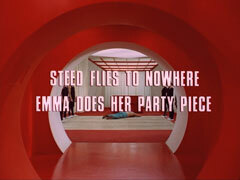 She notices Wade's coffin is empty and goes outside, where she is apprehended by Mrs Peel, who tells her Steed knew the invitations were false. They return to the house where Wade knocks out Mrs Wilde, but fails to notice Mrs Peel, who attacks him when he goes to shoot the groggy Steed - much to the astonishment of Jessel and Kanwitch. She gains the upper hand and flings him off the same balcony he had fallen from earlier. 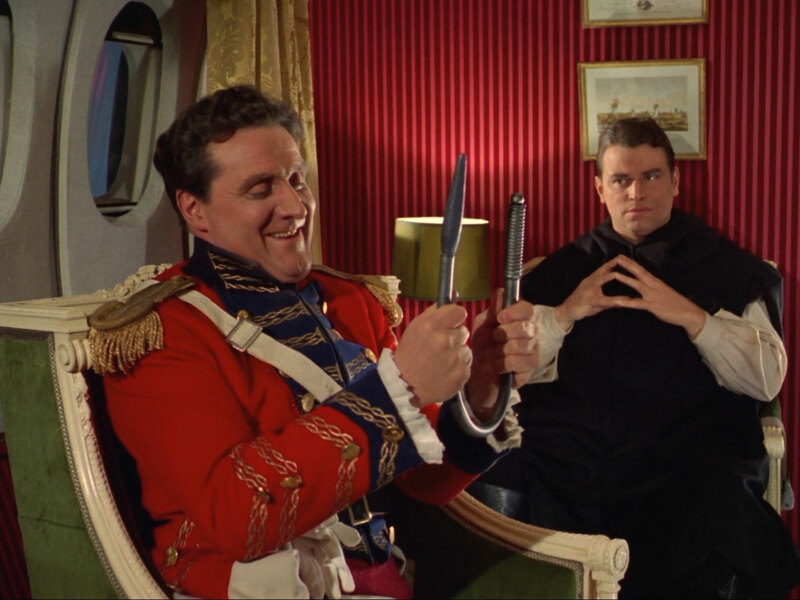 Steed doesn't believe it, and Emma reveals her Wade, and the body of his identical twin, hidden under some tufts of grass: Gemini - there were two of them! Kanwitch realises he's been deceived and is gunned down by Jessel, who goes to kill the Avengers - but his gun is shot front his hand by Mrs Wilde, who has just recovered. 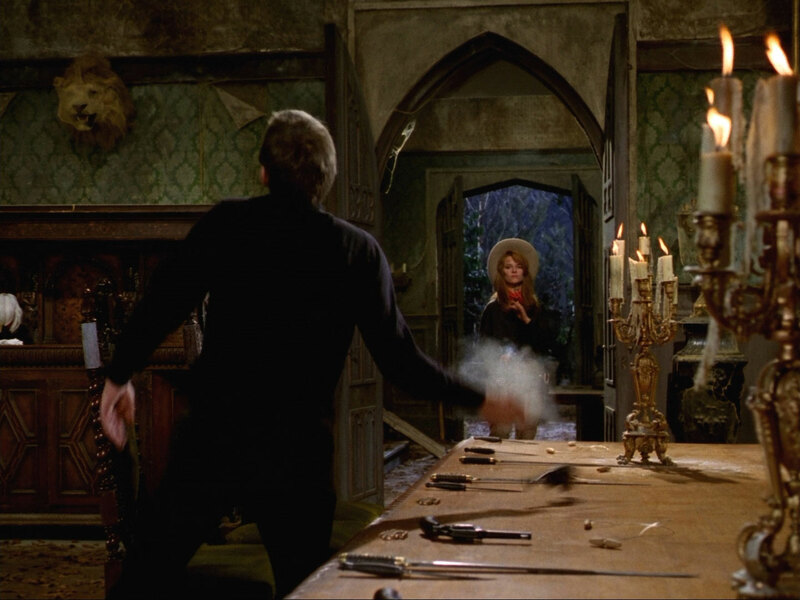 He backs down the dining table, trying to grab each revolver in turn before she can shoot them away, but she's victorious each time, until he reaches the head of the table, where Steed clobbers him with a candlestick. Mrs Peel's out shooting ducks and brings down a brace - of teddy bears! "I think I just winged Father Christmas", she tells Steed - but he tells he she missed the bottle of Bollinger, hidden in one of the bears. She bags a brace of glasses for them to drink from.